As part of the emphasis on science, technology, engineering, and math (STEM), secondary science education has been re-envisioned so that students not just learn facts, but also conduct their own original experiments in the classroom. Unfortunately, in this traditional classroom education, a critical part of the scientific process is missing. The process of writing and communicating the results of students’ work to the wider scientific community is often absent, simply because there is no mechanism in place for students to share their work. 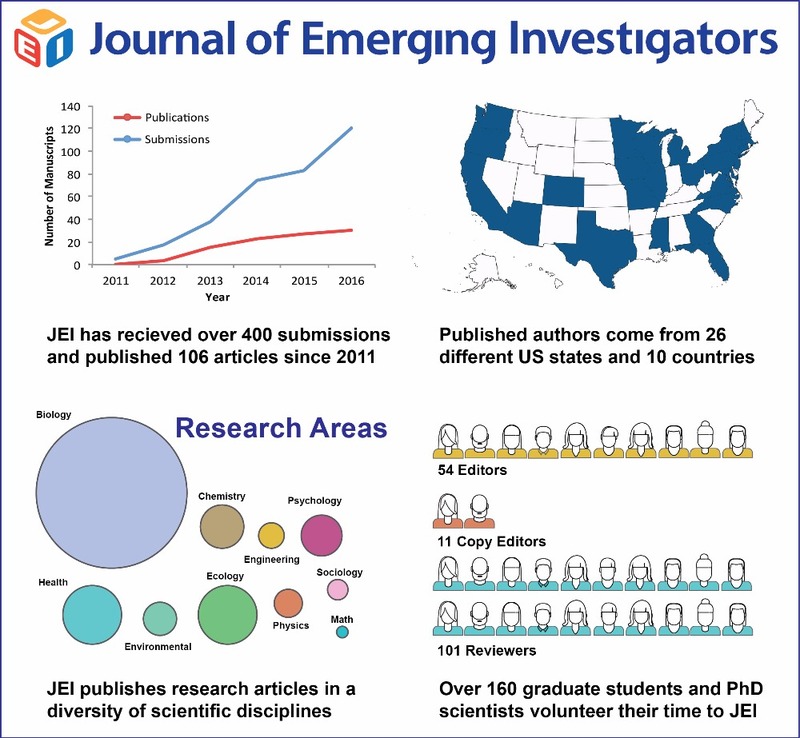 The Journal of Emerging Investigators (JEI) is a non-profit organization dedicated to enhancing scientific literacy in middle and high school students. The mission of JEI is to teach students how to think clearly and creatively, training them to navigate scientific literature, and write about their experiments in context of their respective scientific fields. Through JEI, students receive extensive feedback on their science projects from Harvard-trained PhD scientists, hone their science writing skills, and can publish their work in our free, open-access journal. All articles are published on our website, where they offer a rich resource for educators to teach their students how to approach and appreciate professional science writing. Like any other research project, JEI started with an observation. At the end of several local science fairs in the Boston area, all of the hard work of the students – their data and conclusions -- often went into the trash once the science fairs concluded. It was disappointing to say the least, and to us, represented a large gap in science education. But it led to an important question: How could we keep the work of these young scientists’ alive past science fair and share it more broadly? Both these students and the greater scientific community would be best served by publishing their work, yet there was no science journal dedicated to publishing the work of middle and high school students, which was also free and utilized a review process to engage students in critical thinking about their science. So we said to ourselves: Why not start the journal we envisioned? In 2011, three graduate students at Harvard Medical School founded JEI as a 501(c)(3) nonprofit organization, dedicated to providing a free platform for middle and high school students to publish their scientific research. Six years later, JEI is the preeminent peer-reviewed research journal dedicated to middle and high school science research. JEI is not just a platform for publication, but also an educational experience for middle and high school students. 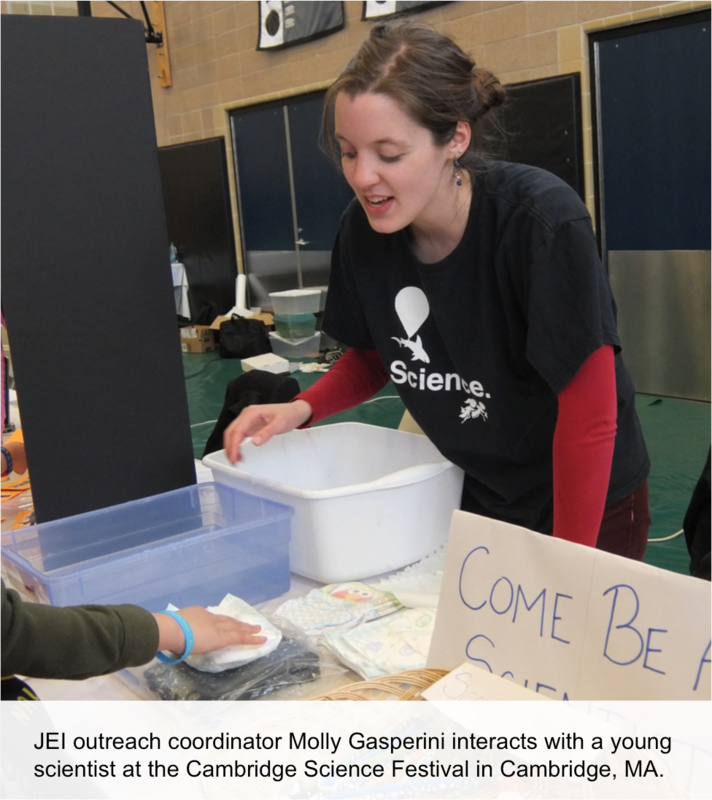 JEI engages young scientists in an essential part of the scientific process: peer-review and publication. We support young scientists in developing and answering their own scientific questions, guide them to think critically about their research, and provide the opportunity for young scientists to fully engage in the scientific process by publishing their research in a scientific journal. JEI is unique among journals for young scientists in that all articles undergo peer review, just as in professional scientific journals. In the peer review process, reviewers not only evaluate manuscripts scientifically, but also give recommendations on the scientific writing. All JEI editors and reviewers are PhD-level scientists, many of whom are passionate about both education outreach and scientific publishing. In addition, JEI provides teachers with resources derived from our articles to teach students how to critically read scientific manuscripts and write their own. As a result, JEI is a tremendous benefit to students, reviewers, and teachers alike. Since 2011, JEI has provided secondary school students the opportunity to publish their original research in our free, open-access journal. During this time, we received over 350 submitted manuscripts from six continents, and published 103 original scientific articles from middle and high school students around the world. In 2016, we received a total of 119 submissions and published 30 articles, and have a volunteer staff of over 160 graduate students and PhD-level scientists. JEI is supported by an entirely volunteer staff, and over 98% of our funds go towards providing educational experiences for students. Our publishing branch started out by using emails, Google Docs, and Dropbox to handle all student submissions and editorial exchanges. Recently, however, it became evident that this system is not efficient enough to keep up with the growing demand. In order to provide a more streamlined and professional publishing experience to both student authors and JEI staff alike, we recently adopted a professional manuscript submission and management system used by several major scientific journals. Each new student submission costs $30, and because we will never charge students for submission of their science manuscripts, we seek your help to sponsor talented young scientists in their pursuit to publish their science research. Every $30 of donation will sponsor the science publishing experience of one student, who will explore his/her scientific passions and take pride in the scientific article that he/she produced. If we raise funds beyond our initial goal, we will use donations to fund science-writing workshops and local school visits within the Greater Boston area. Please contact us at questions@emerginginvestigators.org with any questions or comments! Detailed expenses for FY18 as well as projected 3-year expenses are available upon request at treasurer@emerginginvestigators.org. Journal of Emerging Investigators, Inc.